Investors are in for a lot of pain as Sharp Ratio reverts to mean. Everyone’s familiar with the classic 60/40 investment portfolio. If you’ve ever dealt with financial advisors, this is the standard allocation they’ll recommend. 60% of your money in the stock market, and 40% in bonds. The standard 60/40 portfolio grew an average of 9.88% per year. And not only that, but the Sharpe ratio was at a stellar 1.33! 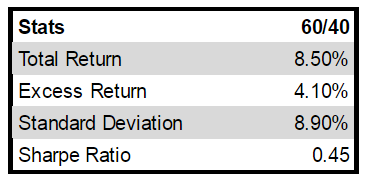 The Sharpe ratio is a standard industry measure for calculating risk-adjusted return. It takes the average return, subtracts the risk free rate, and then divides that difference by the standard deviation. The result is the excess return per unit of volatility. It basically tells you how much risk and volatility you had to endure for that extra return. A high Sharpe ratio means you’re getting more excess return for less risk. So the higher this ratio is, the better. See the Sharpe ratio? It’s only 0.45… much lower than our current period’s ratio of 1.33. So our 70 year average is .45, but our current ratio over the last 6 years is 1.33. What do you think will happen next? Do you believe we’ve reached a new era of permanently higher Sharpe ratios? An era where the new normal is high returns with low volatility? What goes up must come down. It’s a pretty good bet that the current 1.33 Sharpe ratio will revert back to the .45 long term average. Now you can do the math to find out what level of Sharpe ratios we need to print over the next decade to get back to this average, but long story short, it’s not pretty. Investors are in for a lot of pain as this number reverts back to the mean. The worst part is that everyone has gotten used to this high return, low volatility environment. They aren’t prepared for the pendulum to swing back the other way. They never are. And that’s why we get boom/bust cycles and all the joy and misery that comes with them. Going forward there are two possible scenarios that can play out which will send us back to our long-term average Sharpe ratio. The inflation scenario and the deflation scenario. In the inflation scenario, bonds get killed. Bonds as an asset class are very asymmetrically skewed right now. There’s a lot of downside, with not much upside. As you know, when interest rates go up, bond prices go down. And at this point we’re near the zero bound in interest rates. There’s not much room for the Fed to maneuver to the downside. But the upside is wide open. In general, longer term bonds (like the ones in a 60/40 portfolio) are more sensitive to interest rate changes than shorter term bonds. This is explained through the concept of “bond duration”, a rabbit hole we won’t get into right now. What you do need to know is that there’s a lot of risk to the price of these bonds if interest rates move higher from here. The Wall Street Journal has a tool you can use to test the effect of various interest rates on different dated bonds. It includes a variety of countries’ bonds with different terms, from Italy’s five-year, to the US 10-year, and even France’s 50-year. If you take a look at the US 10-year, you can see that decreasing rates by half a percent will cause a 5% rally in the bond price. On the other hand, raising rates by 2% will cause the bond’s price to drop 17%. This is what we mean by asymmetry. The risk-to-reward is skewed for long term bond holders. There’s a lot more downside risk than upside reward. Inflation will come back. And when it does the Fed will be forced to raise rates. Once they do, we’ll see long term bonds get dumped. The rout in bond prices will be detrimental to the standard 60/40 portfolio and will effectively bring our current Sharpe ratio back down to earth. The second possible scenario is the deflationary scenario. This is where the entire global system deleverages to reach a manageable debt to income level. Cash becomes king in this environment. People will start hoarding their money, refusing to spend. This will in turn cause a deflationary loop where lower spending leads to lower corporate profits, meaning lower incomes for employees, which again leads to even less spending. Stocks will face huge price declines as corporate profits deteriorate and investors get rid of their shares. Risk assets in general will fall as investors find higher (and safer) returns in holding cash. The standard 60/40 portfolio will suffer as the equity decline plays itself out. We believe the deflationary scenario has a highest possibility of occurring. But in either case, we see major problems brewing for those holding the standard 60/40 portfolio. As this portfolio reverts back to its long term average Sharpe ratio, these investors will take a beating. By Alex M., Macro Ops. Hedge fund manager David Tepper is all over this energy MLP theme. Read… Should You Follow David Tepper’s Big Bet? Own and hold physical gold and/or silver outside the system. Both are wealth preservers. Paper wealth rests upon quicksand. But I suspect that when the collapse comes — if I were to put a kg of gold coins in one pile – and a pile of canned food 20 metres past the gold — the hordes will race past the gold and grab the cans instead. Perhaps hording can openers would be a better idea. This new study by David Korowicz explores the implications of a major financial crisis for the supply-chains that feed us, keep production running and maintain our critical infrastructure. He uses a scenario involving the collapse of the Eurozone to show that increasing socio-economic complexity could rapidly spread irretrievable supply-chain failure across the world. The deflationary scenario would be the result of any attempt to raise interest rates beyond the Feds 1/4 percent hike per year or two. The fiscal position of governments cannot absorb ‘normalized’ rates and neither can the private economy now. Central banks have painted themselves into a corner. Debt service costs would explode and asset prices collapse in a world of ten year bonds at 4-5%. Central Bankers speak of their ‘helicopter’ option but the public wouldn’t stand for it. Devaluing the real value of government transfer payments to the poor and hard won savings of the retired and working population through inflationary money printing would be politically impossible. No it isn’t. Savers be damned. That is the state of affairs in Europe and Japan via NIRP. And the real savings rate for Americans holding their cash in savings accounts is negative given the almost zero interset rate they are receiving and the rate of inflation. LOL no no no substitute “us” for “themselves” . And it’s YOUR money being debauch and the future of YOUR children that has been seized and sold. Is everyone drunk on the kool-aid? Well said. Fiat currencies all eventually collapse as money is printed to cancel out debt used to “grow the economy”. Citizens received welfare payments, government jobs, generous military contracts and jobs for unskilled high school grads – all without paying for the largesse with taxes. It has been a nice ride but the time for savers to pay the price for all of society’s sins of the past seems to be nearing. There will be little political fallout because savers are a small percentage of the population. The majority are borrowers and will benefit from a currency crisis – that’s why very few seem to care about the current financial repression. They don’t care because they don’t understand what the hell is happening in the first place as long as they have bread and circus. “The majority are borrowers and will benefit from a currency crisis…” And exactly where will this currency crisis come from if Japan, the Eurozone and the Chinese are all RACING to devalue their currencies FASTER than we are? Don’t get it. Correct. People have short memories and frequently ignore history. It was not “different” last time, or the times before that and it will not be”different” next time. There is no new normal where high risk is mitigated unless you listen to the chattering sell side (which includes much of the main stream media) who, as they have reliably done in the past, will tell you what you want to hear. The effect of technology, which is continuously improving, is to reduce prices through productivity gain, which on the face of it is “deflationary.” But all this means is that X dollars buys a greater variety of goods, providing jobs in a greater variety of industries. So why is it always assumed that falling prices will tank the economy? Because if prices are falling, people put off purchasing until the lower price appears…which of course it never does. Further, if prices are lowered so are profits and the ability for business to increase wage rates. As paycheques stagnate, or even shrink, purchases are again put off forcing even lower trends. I forgot to include that, imho, technology increases sometimes adds to productivity, but if we already produce enough stuff, this increase does not promote increased job growth in other industries. In fact, all it does it promote the loss of jobs, thus reinforcing the downward spiral. Plus, if people believe a productivity increase may affect their employment security, they will also put off making purchases. If we only had crystal balls…..
One thing I have been noticing is people slowing down their purchasing simply because they are off the consumer bandwagon. It seems like folks that can are choosing to get off the treadmill. This is what happened between 1865 and 1900. Prices came down, across the board, for just about ALL businesses and products. The cost of transportation fell dramatically as more and more railroads were being built, each more efficient and less expensive than the last to build, equip, and operate. Huge quantities of cheaper and cheaper coal came on the market, and thus the spiral from Free Enterprise and GOLD (as money) and technological changes, drove prices down. The production price of iron, then steel, was DOWN as quality went up, which enabled the Rail Roads to convert iron rails to steel and then haul larger cars, which further drove down shipping costs for everybody. With GOLD as money, costs went down and the “value” of the GOLD went up since the same gold coin could by more, as prices of goods kept going down. BUT THAT WAS A BAD THING for the “1%” and that is why it came to an end. The major industries were financed by bonds. The 1% wealthy families of Europe purchased them, or the Bankers (at that time all private entities since there were no “Public Pension” or retail market.) They had so much invested in the early processes (lets say 1865 to 1875) and the falling prices made it impossible to service the large original debts that had to be paid back in GOLD. The 1% didn’t like falling prices at all. Their Gold Bonds became worthless. But,those private held companies, that were not built on debt and did not owe the original investors a fixed Gold “coupon” return (Standard Oil, Carnegie Steel) continuously reinvested their profits, expanded, and keep alive by dropping prices. Still, newer factories came on line that could charge less, even using bonds, but the spiral of prices kept going down. They tried to form “pricing” pools, Gentlemen’s agreements, market share agreements, exclusive selling areas. None worked. Everybody cheated. Thus, the only solution was ONE COMPANY for each industry, since “competition is a crime.” (John D. Rockefeller). From 1885 it worked for a while, but with each industry STILL becoming more efficient, prices STILL were going to go down and the VALUE of GOLD always up since the same Gold Coin could buy more and more products. Thus, the Banking 1% created Central Banks to Inflate “money” to keep “prices” from ever falling. Even better, inflate at 2% a year and you can never go broke. Clever. Thus, since 1913 prices have always gone up and that $1 Paper note is now worth 1 penny in purchase since it isn’t gold. CORRECTION: No prices have not always gone up since 1913, but the overall trend for the last 100 years has been higher prices with the cause being paper notes were worth less. There were times (1929-1939) where prices feel, purchasing power of paper notes went up, but the cost of living reacted to this odd situation. Today, substitute “government” for the 1% of the 1870-1900 era, and you have the explanation for why deflation is NOT PERMITTED. Deflation makes growing tax revenues next to impossible. Government does all it can to create steady inflation because otherwise it cannot generate the revenue to pay for entitlements. The real decision isn’t 60/40, it is financial assets vs hard assets. I don’t think anybody really knows which way it will go. Very likely increasing inflation going forward with a 15-20 year time frame, so I would bet on select real estate/commodities and select equities (banking, mining, reits). “Mark Wiseman, outgoing CEO of investment board of Canada Pension Plan, Canada’s national pension plan for four years, will step down on June 13, CPPIB said in a statement. The board manages the assets not required by the fund to pay benefits for its 19 million members. As of the end of March, CPPIB had almost $280 billion under management, a figure that has grown by $100 billion under Wiseman’s leadership. Wiseman’s departure was announced the same day that CPPIB said its annual rate for return dipped to 3.4 per cent last year, its lowest since it had a decline of 18.8 per cent back in its 2009 fiscal year. CPP beneficiaries (every employee), hopefully will have an alternative source of income when they retire. Just like many other measures in the market these days, the Sharpe Ratio has lost its meaning and is no longer a useful tool. Simple: the risk free rate is meaningless in the current environment where the traditional meaning of money has changed. Manipulation of the money markets by the various CB’s has made ‘risk free’ into risk without any way to measure it. Good point, however what happens when semblance of normalcy slowly returns to the capital markets and the Sharpe Ratio once again becomes a valid measure of risk/reward? Invest in robots, automation, clean energy, electric cars, internet of things, genetic engineering, GMO foods, biotech ect… plenty of growth out there.